After Saturday evening’s tilt with the No. 14/15 University of North Dakota, Boston University men’s hockey coach David Quinn asked Matt O’Connor if he felt like he actually faced 58 shots. The sophomore netminder not only responded with an affirmative, but he also went on to criticize his performance, saying he did not control his rebounds well. As much as O’Connor may have wanted to cover up more shots, the Toronto native turned out another strong performance in net as he stopped 55 chances during the Terriers 3-3 tie with North Dakota at Agganis Arena. For the first time this season, and the first time since Nov. 30 through Dec. 6 2012, O’Connor started in three straight games for the Terriers. His streak in goal started halfway through BU’s 7-0 loss against the University of Maine on Nov. 15. Before the weekend series against North Dakota, Quinn said that, while sophomore Sean Maguire has played well this season, he felt that O’Connor had played well enough to deserve the start on Friday. 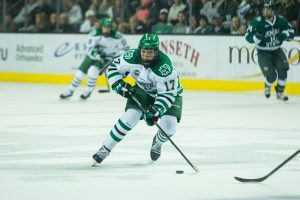 Although the Saturday spot was to be determined, O’Connor made a convincing argument in the first half of the series as he held North Dakota scoreless until the final three minutes of the game. Saturday’s game, however, started out far differently from the previous night as North Dakota came out with more physical play. Within the first few minutes of the game UND wing Stephane Pattyn charged the net, pushing O’Connor into the crossbar. While the netminder said he felt the hit, he continued to protect his crease – something he said he was working on earlier in the season. North Dakota, which had a total of 84 attempted shots during the game, also increased its attempted shots from 67 on Friday to 84 on Saturday. “He’s a good goalie, a very good goalie,” Pattyn said. “If we threw pucks at him odds were a couple were going to get in, and if we get traffic in front of him… I think that was our main goal. While O’Connor pegged his difficulty controlling rebounds as part of the reason for the number of shots, Quinn also pointed out that the number of BU shots that missed the net also had an impact. Despite this added offensive pressure, O’Connor put shot after shot aside, leading to a career high number of saves. A BU goaltender has not registered more than 55 saves in a game since former Terrier Kieran Millan stopped 68 shots during BU’s game against the University of New Hampshire during the Hockey East quarterfinals on March 11, 2012. That game went into two overtimes. Although Quinn said that it was too early to determine whether O’Connor will pick up his fourth straight start next weekend during the Red Hot Hockey game against Cornell University at Madison Square Garden, he pointed out that O’Connor’s performance followed a trend from the entire season. “He has been building on every performance he has had,” Quinn said. 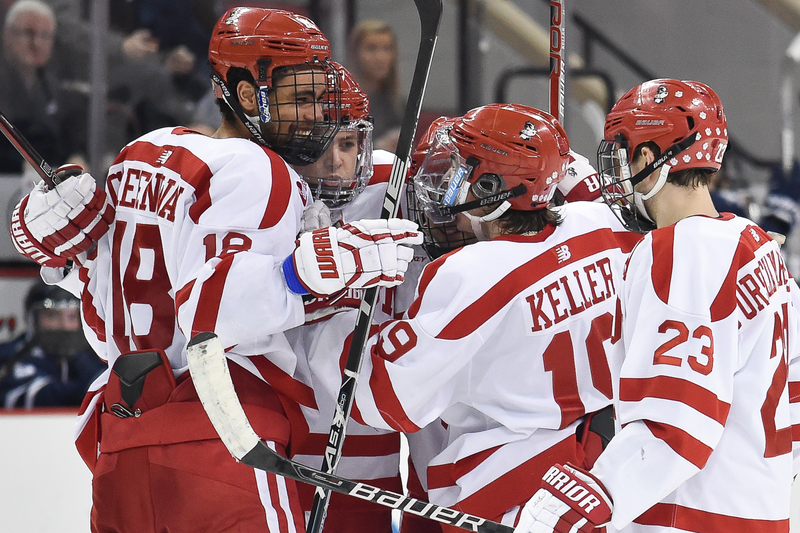 For the first time since the season’s opening weekend, the Boston University men’s hockey team played two games and didn’t lose either of them. The Terriers (6-6-1, 2-3 Hockey East) tied No. 14/15 University of North Dakota, 3-3, at Agganis Arena a day after taking the series opener. The teams were quite even on the scoreboard — each squad netted one goal in each of the three periods — but North Dakota (4-6-2) held a significant shots-on-goal advantage, 58-31. Both teams had a number of chances in the five-minute overtime but none of them resulted in what would have been the game-winner. Here’s a look at what the Terriers did and did not do well. The sophomore goaltender was the story again Saturday night, just as he was in Friday’s win. To read more about O’Connor’s game, read Meredith’s piece here. BU’s man-advantage got off to a rough start early but by the end of the night it was buzzing similar to the way it was Friday. Senior captain Garrett Noonan converted on one chance in the first period when he scored from the edge of the left circle about seven minutes in — his second tally of the weekend — for the team’s only goal in seven chances. The Terriers finished 3-on-14 on the power play in two games against North Dakota. The penalty kill was similarly successful, limiting UND to one goal in nine chances on the weekend. In another similarity to Friday night’s 3-1 win, Noonan seemingly took over at will on occasion, particularly when tensions were running high. UND came out of the gates fast and chippy, but the Terriers, particularly Noonan, were able to keep their emotions in check despite getting gloves in their face multiple times. Freshman wing Nick Roberto said that objective came from the coaches. The freshman defenseman picked up his first collegiate point, a secondary assist on the game-tying goal from classmate Robbie Baillargeon. Quinn has done a good job of, well, convincing the Terriers to curb the number of penalties they take, but Saturday represented some regression in that category. They took eight minors for 16 minutes, their most since the season opener. While North Dakota’s general aggression and puck possession forced some of these, a number stick out as egregious. Freshman wing Tommy Kelley committed a tripping infraction in the offensive zone while BU was on the power play in the second, and senior wing Jake Moscatel (charging) and sophomore wing Mike Moran (elbowing) wound up in the penalty box during a tight third period. Before Saturday, the last time BU took more than four penalties was Oct. 26 against Michigan State. A very common phrase on the live blog, much to Quinn’s displeasure. The Terriers shot and missed the net 24 times, and the BU bench boss estimated the hard bounces off the boards resulted in 15-20 shots for North Dakota. “There are a lot of reasons to shoot,” Quinn said. “Obviously the first one is to score, but a lot of times you shoot a puck to create a rebound or possess it in the offensive zone. Too often we’re just shooting to score a goal, and there’s really not an opportunity to score. The Agganis Arena ice seemed to be tilted in No. 14/15 University of North Dakota’s favor Saturday night, as it outhit and outshot the Boston University men’s hockey team. BU sophomore goaltender Matt O’Connor did his part to even things out though, making a career-high 55 saves while helping the Terriers to a 3-3 tie. It was the Terriers’ (6-6-1, 2-3 Hockey East) first tie since Feb. 15, 2013 at the University of Maine. They ended their weekend series with North Dakota (4-6-2, 3-5 NCHC) with a win and a tie — their first weekend without a loss since the first two games of the season. It was a physical contest early on with several extra scrums between the teams after the whistles and some huge hits. One of the biggest collisions came between two of the most talented players on the ice, as UND sophomore Rocco Grimaldi leaned his leg out and collided full-speed with BU sophomore center Danny O’Regan. Both players were left shaken up on the ice, and Grimaldi was sent to the box for a tripping penalty that gave BU a 4-on-3 advantage. The Terriers took advantage of that power play, when senior captain Garrett Noonan faked a shot to draw North Dakota goaltender Zane Gothberg to his knees and then snapped the puck through a screen into the top right corner of the net. 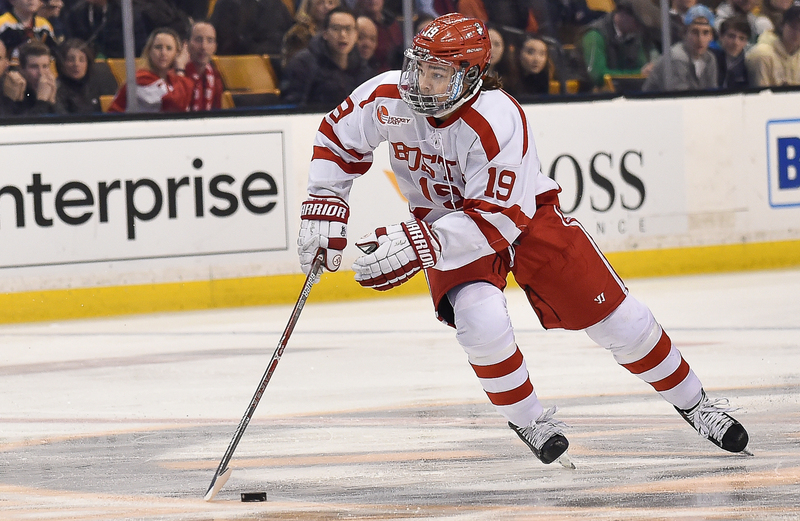 It was Noonan’s third goal of the season, which is the most among BU’s defensemen. North Dakota needed less than two minutes to respond though, as winger Bryn Chyzyk snapped a wrist shot from BU goaltender Matt O’Connor’s left through traffic and into the back of the net for his second goal of the season. The game was tied, but UND had the momentum and the majority of the puck possession through the first period. The game remained tied until almost seven minutes into the second, when O’Regan slipped a pass through a defender’s legs and onto freshman winger Nick Roberto’s stick. Roberto blasted a one-timer over Gothberg’s right shoulder and into the back of the net for his fourth goal of the season, and once again appeared to give BU some life. It was the Wakefield native’s third consecutive game with a point since moving from center to wing, and he has recorded a point in six of his last seven games. Again though, North Dakota responded quickly thanks to its dominance of puck possession. North Dakota junior Stephane Pattyn, who had already made his mark on the game with several big hits and extra jabs in the game, finished off a pass from linemate Michael Parksin close to O’Connor for his second goal of the season. The goal left UND tied with the Terriers through the first two periods in spite of its 30-13 shot advantage. With senior winger Jake Moscatel in the penalty box for charging in the third period, North Dakota finally jumped out to its first lead of the game. Junior Brendan O’Donnell faked a shot before firing the puck over to wide-open freshman Adam Tambellini, who had no trouble giving UND the 3-2 lead. It was the Terriers who responded this time though. Junior forward Evan Rodrigues tried to pass the puck across the slot on the rush, but the puck bounced off a North Dakota defender and over to freshman center Robbie Baillargeon, who touched the puck into the back of the net to tie the score. Freshman defenseman Dalton MacAfee was credited with the secondary assist on the play, which was good for his first collegiate point, and the game was tied at three. Each team had a couple of good scoring chances on the rush in overtime, but neither could break the tie. BU was outshot 58-31 in the contest, which is the worst shot differential it has had this season. The minus-27 margin even beat out the minus-25 shot margin it had in its 2-1 loss at the University of Michigan. Part of the reason for the dismal shot margin was the amount of Terrier shots that missed the net. BU missed 24 of the 66 shots it attempted throughout the contest, which was something Quinn singled out as a big problem. “It’s a youth hockey mentality,” Quinn said. “It’s just, ‘I’m just going to pick top corner, bar and in.’ If you’re doing that, you wouldn’t be in this league. 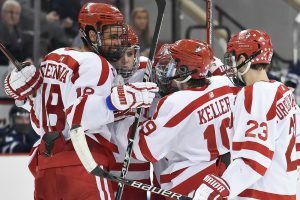 For the first time in a month, the Boston University men’s hockey team found the back of the net in the opening frame of a game. The goal, scored by sophomore wing Cason Hohmann, showed a change in the Terriers shooting mentality. Just moments later, however, the improvement in BU’s aggressiveness fell to the wayside for a moment as University of North Dakota wing Wade Murphy tripped Hohmann, aggravating the Terrier’s lingering shoulder injury. While Hohmann’s set back left a down mark on the game, BU went on to win Friday evening, as it defeated North Dakota 3-1 at Agganis Arena in front of a crowd of 3,882. BU coach David Quinn has talked in the past about the Terriers’ shooting mentality, or rather, the lack thereof. While Quinn has said on multiple occasions that he cannot account for why BU’s offensive production has predominantly occurred in the second period, he said that the team’s ability to get on the board early on Friday had to do with a proper shooting mindset and not slowing down. Sophomore netminder Matt O’Connor will get the start Saturday night in the tail end of the series against North Dakota, marking the first time this season that either O’Connor or his counterpart Sean Maguire will start two games in a weekend. Although North Dakota struggled to get shots in close during Friday’s game, O’Connor stymied the UND offense multiple times, including a few late in the period when North Dakota pulled its goalie for the extra man. About five minutes into the third period, with the Terriers holding onto a 2-0 lead, freshman wing Kevin Duane picked up a rebound and notched it into the a nearly wide open net. The goal, his third of the season, and his second straight scored on the power play, gave BU some insurance early in the final frame of play. For more on Duane’s performance, head over to Kevin’s sidebar here. Obviously the biggest draw back from tonight’s game was when Hohmann injured his shoulder just after registering his third goal of the season. The 5-foot-9 wing looked as though he tried to avoid going into the boards on the hit by Murphy, but it was to no avail. Within seconds of going down on the ice, he popped back up grabbing onto his left arm and screaming toward the bench. He quickly skated off the ice and went down the tunnel. “He’s had issues with [his left shoulder] all year,” Quinn said. “We talked going into this game how this may be a reoccurring problem with him, and sure enough, before the first period ends, he gets hit pretty good and the thing pops out and he’s done for the night. For the second straight contest, O’Connor gave up a goal in the final frame, just missing his chance to pick up his first shutout of the season. Against the University of Connecticut last Sunday, that goal came about four minutes into the third. On Friday, it came with less than three minutes left in the game. “I feel like after that goal, I’m still hungry for another game,” O’Connor said. The Toronto native has not recorded a shutout during his time at BU. The moment the puck moved back to the point, freshman forward Kevin Duane knew exactly where to go. The 6-foot-5, 210 pound winger anticipated the shot from sophomore defenseman Matt Grzelcyk and did what he does best — get to the front of the net. University of North Dakota goaltender Clarke Saunders saw little else besides the No. 18 on Duane’s back as the puck caromed off of his outstretched pad and into an open space to the right of the goal. Saunders had no shot to recover, as Duane simply scooped the rebound up and put it into the gaping net. 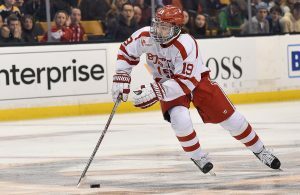 The goal helped give the Boston University men’s hockey team some insurance in its 3-1 win over No. 14/15 North Dakota Friday night at Agganis Arena, and it was the result of Duane’s increasing success at his role on BU’s power play. It was the second game in a row that Duane has scored a power-play goal. Sunday night against the University of Connecticut, Duane once again found himself in front of the net on the power play, and this time deflected the puck into the back of the net before the rebound opportunity. For Duane, he is not trying to create his own shot on the power play like the players who move the puck around the outside of the offensive zone. Duane is playing a role that the Terriers used sophomore winger Sam Kurker in during the end of last season and the first few games of the season. With Friday’s goal, Duane matched sophomore defenseman Ahti Oksanen and junior winger Cason Hohmann’s team best two power-play goals on the season. His efforts have helped boost BU’s power-play percentage to 22.0 percent on the season, which is good for second-best in the league. The team’s power play has produced 37.9 percent of its goals on the season, making it an integral part of their offense. Duane has not limited his improved play to the power play though. He has been a part of a line that features fellow freshman Dillon Lawrence and sophomore Mike Moran that has been very impressive as of late. Quinn put the unit together last Friday night at the University of Maine as a fourth line, but it impressed him enough to keep the trio together and increase its ice time over the past two games. While none of the three have scored a 5-on-5 goal yet, it has been good at keeping puck possession in the offensive zone. One would expect the unit to remain intact for Saturday night’s rematch with North Dakota. However, with Hohmann injuring his shoulder in Friday night’s game and expected to be out “for a while” according to Quinn, there is more opportunity for the freshmen wingers like Duane, Tommy Kelley, Brendan Collier and TJ Ryan to see the ice and get scoring chances. If Duane keeps playing the way he has as of late, he could help fill a serious void in the Terriers’ offense. “This is going to be another opportunity for freshmen to continue to take advantage of opportunities and playing time and hopefully they can continue to flourish,” Quinn said.